Have I told you before about Loco Lindo? They make mighty fine things, sewn in California. I have bought several of their pieces over the years from my local dress shop, and I have purchased one or two things directly from them, here. What makes them special, besides the nice prints and classic cut of the clothes, is that the rayon crepe they use can be wadded up into a ball in your suitcase, and after ten or fifteen minutes of wearing it, it has nary a wrinkle. It cannot be beat for its draping qualities, either. Right now, they have a cherries on navy print, too. And a tumble of red hearts on black. 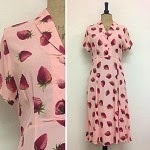 I hope you have a garden party that requires one of these dresses, or a gig that your all-girl band is playing soon, where you'll want one of these skirts, or the opening of an art exhibit where you'll wear a kimono, or even a book signing you will want a new blouse to wear to.